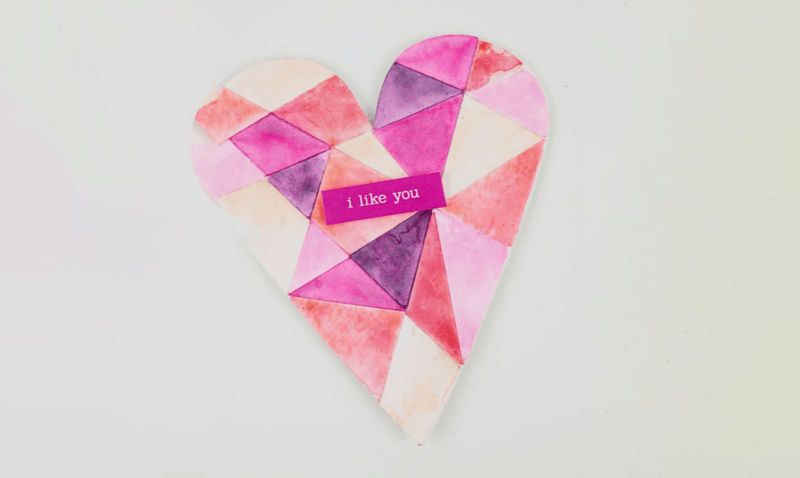 For a slightly abstract look, this watercolor geometric valentine is a sure win. It’s simple to make and beautiful to behold. You can easily adapt it to just about any color palette you like. And if watercolors aren’t your thing, you can change that up too! Doodle with pens. Coat each piece with glitter. Or create your collage out of your favorite medium. The more personalized you make it, the better! You can save with one of our Bluprint coupons, too! 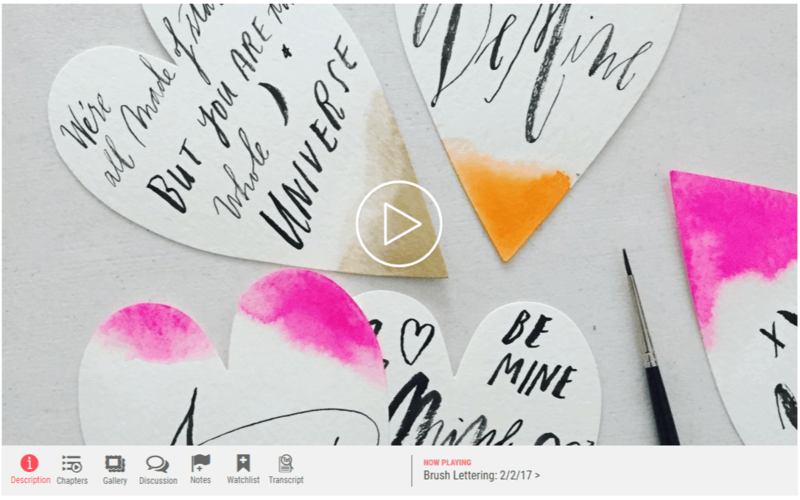 This brush lettering class is a great way to make a super personal valentine for your love. Sign up for the CreativeBug free trial to take the class at no cost. It’s taught by Diva Pyari (a.k.a. Linea Carta), so you know it’ll be fabulous. You’ll learn to hand-letter cards for any occasion. 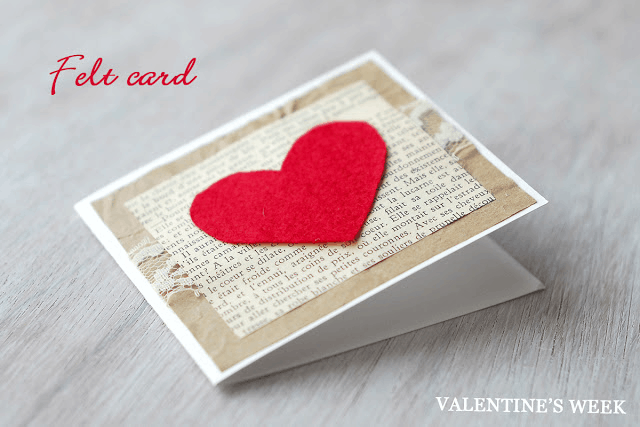 Create a Valentine based on a personal sentiment or quote. Make one with an in-joke only your sweetheart will get. Hand letter their name. The possibilities with this one are endless, and you’ll also have a new skill to use in future projects too! 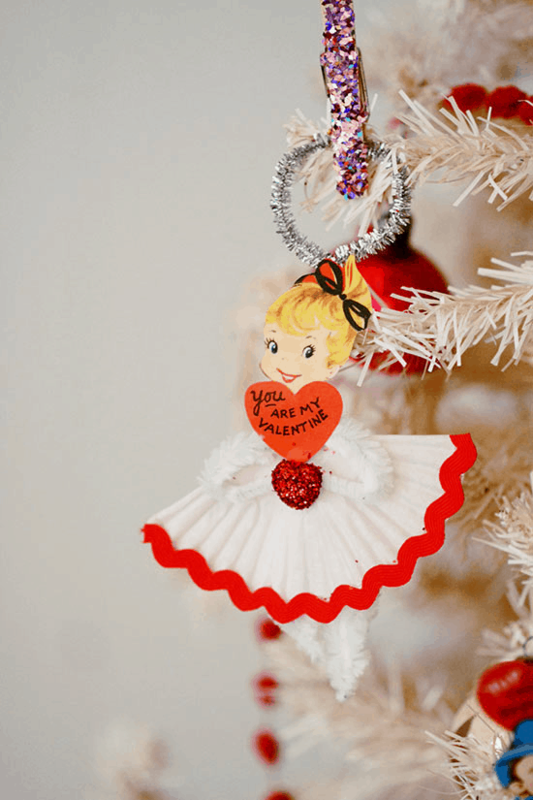 These adorable paper dolls are beautiful, creative, and super easy to make. Reminiscent of handmade retro Valentines, they’re great for adding to a gift or to adorn a bouquet. Grab the free printable from the Hobby Lobby site and add in a few simple crafts supplies you may already have lying around. You can also use actual vintage Valentines if that’s your thing! What’s better than a Valentine’s Day Card from someone you love? A JUMBO Valentine’s Day Card from someone you love of course! This super creative hand-drawn card is a great way to use blendable crayons like Hydrostix, which are available at Michaels. I know this one’s marketed as a kid’s project, but honestly, grown-up kids would have just as much fun creating a giant card and blending the colors! And since you can get as creative as you like with this project, it’s another one that’s simply begging you to put your own twist on it! Sometimes simplicity is more elegant than detail, and sometimes a little oops can change a project entirely — for the better! This card was born from one of those serendipitous oops moments. Originally intended to be a hand-stitched card, this one serendipitously changed into the simple design you see here. Bonus – this one is both incredibly easy to make and impressively beautiful! All you’ll need is a page of watercolor paper or some other similarly thick and textured page, a sharp needle or paper piercing tool, red and pink felt, a good adhesive, and a sharp pair of scissors. Talk about simple! Download the printable template at her site above. This beautiful card features the romance of lace and literature, accented with a bright red felt heart. 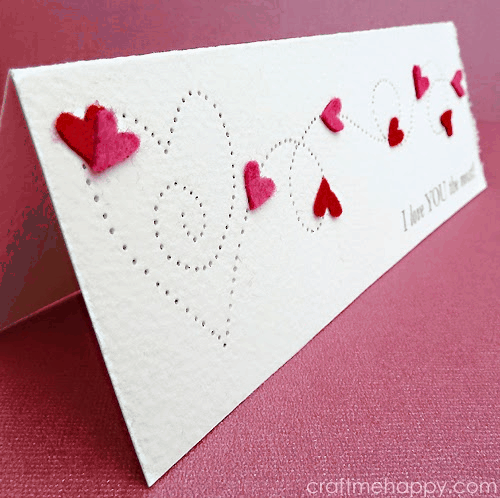 It’s a quick, simple, and stunningly beautiful card that just about anyone can make with ease. Don’t want to cut up an actual book? Try printing the text of your choice on off white paper. Use a love scene out of Shakespeare or Jane Austen, a romantic moment from your favorite novel, or a love poem of your choice. For a special touch, why not create your own text for a special meaning for you and your sweetheart? This one is on YouTube, so you can watch the whole crafting process from start to finish. 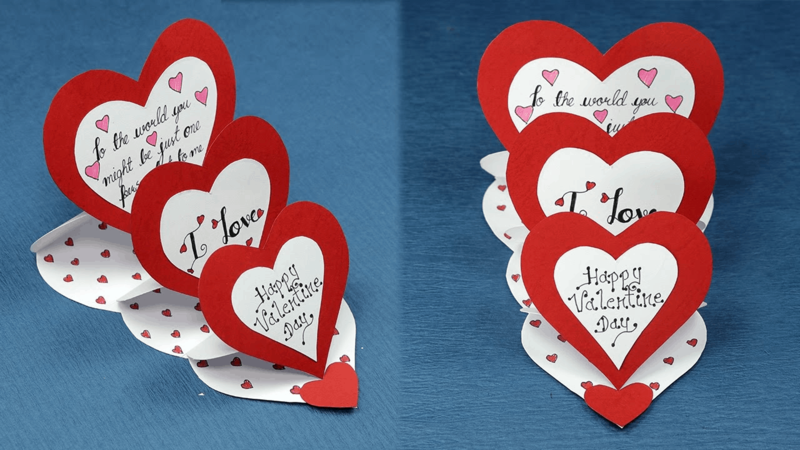 It’s a little more in-depth than many of our other selections, but in the end, you’ll have a really impressive 3D pop-up card to present to your loved one. Use the messages included in the video, or add a romantic message of your own for a one-of-a-kind project your sweetie is sure to adore! This is another less-is-more project. 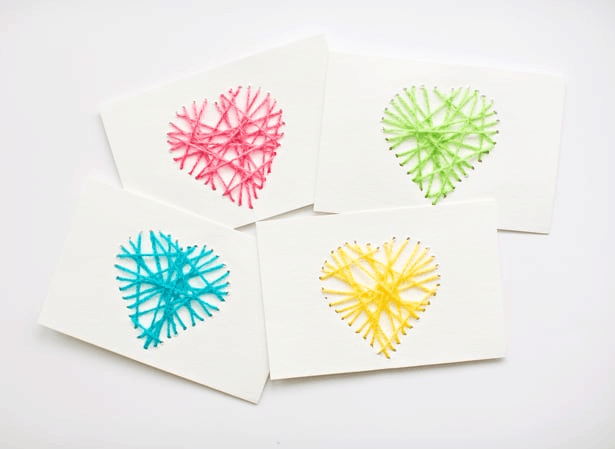 A simple heart made from a tangle of brightly colored string is featured on the front of this card. It looks more difficult than it is. And you can easily put your own spin on it by changing up string colors or weaving patterns. 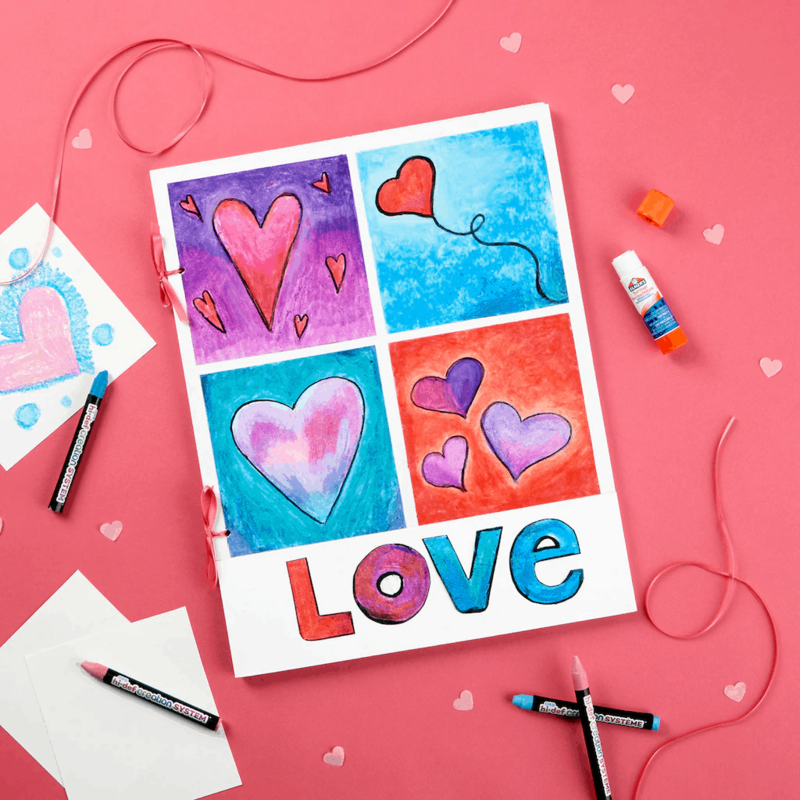 Add the sentiment of your choice, and you have a quick and easy Valentine craft that is simple enough that even the kids could do it! For a more delicate look, switch the yarn for embroidery floss. If you really want the stitching to pop, consider a second layer in a different color. If your Valentine is a bit of a tech nerd or has a serious appreciation for all things 8-bit, you’d be hard pressed to find a better choice than this. This pixel heart pop-up is a perfect backdrop for any sentiment of love. It’s simple and sweet, and easier to make than you might think! Grab some brightly colored paper, print the template, cut, and you’re ready to go. 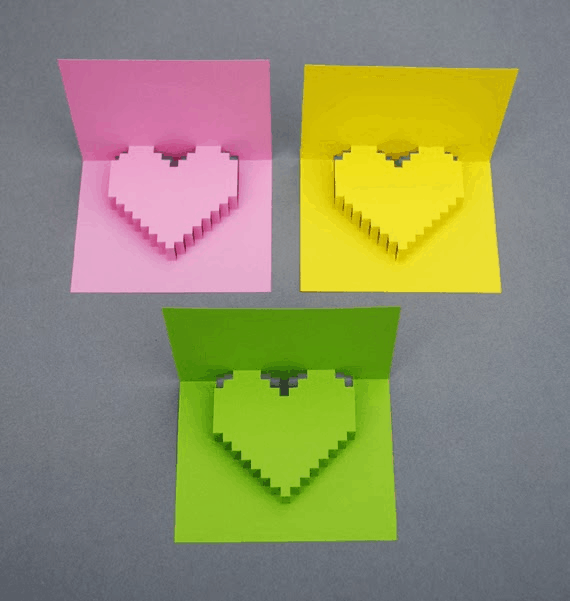 Add some fun confetti and a handmade envelope as shown, or decorate your pixel heart however you like. You really can’t go wrong with this one! If you want a really impressive look that’s actually really, really easy to create, you’re going to want to give this one a try. The pinhole heart on this card is simply made by poking a sharp sewing needle through the cardstock. But it gives the card a really detailed embossed look you might expect from some of the more expensive card companies. 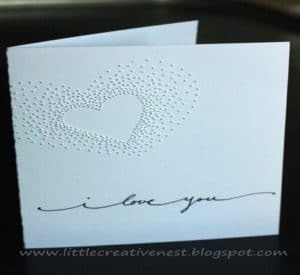 Add a scrawling “I love you” on the bottom and the sentiment of your choice inside, and you have a stunningly simple card that is as elegant as it is easy! From all of us at Crafts Glossary, we wish you a happy & festive Valentine’s Day!